The only thing I knew about Next to Normal before I saw it last Saturday was that the main character’s cuckoo. Okay, wait. Two things. That I also had to bring a lot of tissue because it will make me bawl like a baby. True enough, the main character has bipolar disorder and this sickness creates a myriad of issues in her family. The play also deals with drug abuse, young love, suicide and coping mechanisms. Kudos to the cast especially to Menchu Lauchengco-Yulo and Jett Pangan who played the parts of manic depressive Diana and the steadfast husband Dan Goodman. They’re both stellar! Absolute theatre gems! They managed to make me cry and the rest of the audience several times. In fact, there was a guy behind us who started crying in the first 15 minutes of the play. Even my friend Ralph couldn’t help but cry. Felix Garcia as Gabriel was an effective figment of imagination/haunting past. His eyes conveyed fear, laughter, menace, grief in all the right scenes. Bea Garcia as Natalie did great as a troubled teen and I liked her except for the first few minutes of the show when her voice was a bit raspy. Markki Stroem as Henry (Nat’s devoted boyfie) was cute and sweet and I loved his voice. I wish he was singing Perfect For You to me. Hehe. :p And Jake Macapagal as Dr. Madden looked like a rockstar psychiatrist indeed! The set design was fantastic. The music was captivating. The songs were gripping. I’ve been listening to all the songs since morning (Thank you, internet!) and I have a feeling I’d still be listening to ’em for the rest of the week. I guess the reason why I found this play next to perfect is because I am able to relate to the lines delivered even if I do not have a manic depressive mother or a tree hugger for a boyfriend. I’m going to end this entry by posting my most favorite line. And before it, I am inviting all of you to catch Next to Normal at the Carlos P Romulo Auditorium, RCBC Building, Makati. I think it’s going to run until the 16th of the month. I know my opinion doesn’t really count because I’m not really the best person to talk about theatre (and other forms of art for that matter) so I’m going to give you some facts to convince you. 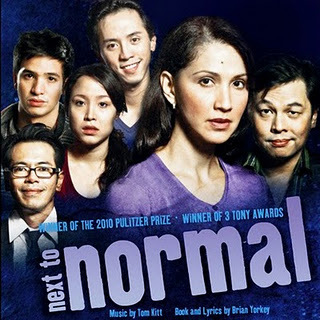 Next to Normal opened in Broadway in April ’09, was nominated for eleven 2009 Tony Awards and won three, Best Original Score, Best Orchestration and Best Performance by a Leading Actress. It also won the 2010 Pulitzer Prize for Drama, becoming just the eighth musical in history to receive the honor. And now to my favorite line. 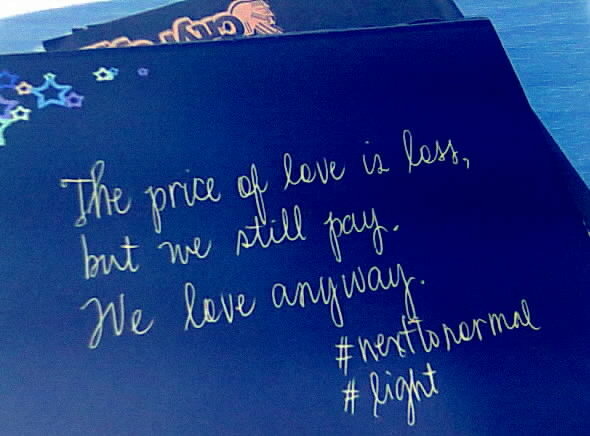 I like it so much that I even wrote it down, took a picture of it and played with it. Sakit sa puso ng Next to Normal. Feel na feel ko si Menchu. Galing! Korek! Hagip na hagip niya ako sa lahat ng eksena! Awww… hanggang this Sunday pa naman!